Dieses einzigartige Protokoll Akzent Kabine liegt direkt am ruhigen Ashley-See. Es bietet einen spektakulären Blick auf den See aus dem 1200 Quadratmeter großen Deck, wo Sie auf den Aufruf von Seetaucher hören und beobachten Sie die Kolibris füttern. Große Glasfenster in der 32 Meter hohen große Zimmer, ein Loft Bibliothek, Esszimmer, Küche und Schlafzimmer bieten auch einen atemberaubenden Blick auf das kristallklare türkisfarbenes Wasser und Berg Rücken fallen. Das 5500 Quadratfuß-Haus bietet sechs Schlafzimmer und drei Bäder komplett mit brasilianischen Tiger Holzboden, Porzellan Fliesen, melden Sie sich Treppen und Dachbinder und einen Stein Kamin Gas zu verbrennen. Die Küche ist komplett ausgestattet und verfügt über Edelstahl-Geräte, Gaszähler Top-Herd und Vermont Castings BBQ direkt vor der Tür. Neben der Hütte ist ein konkretes Feuerkreis, einen Whirlpool auf dem Unterdeck und ein Dock mit einem Bootslift ein paar Schritte entfernt. Das Loft verfügt über zwei große Schlafzimmer, eine Bibliothek, einen Schreibtisch und WLAN-Internetverbindung. Es gibt vier Schlafzimmer auf der unteren Ebene eine Erholung / Theaterraum mit Projektor und sechs Fuß Bildschirm umgibt. Im Erdgeschoss befindet sich die Küche, ein Esszimmer und ein tolles Zimmer. Es gibt auch eine "geheime" Spielzimmer für jüngere Kinder durch den Regalen der Bibliothek eingetragen. Wir haben einen speziellen Tarif Programm aufgenommen, die Sie nur zu nutzen und bezahlen können, was Sie brauchen. Wir vermieten zu einer Zeit nur eine Partei, so dass Sie das Haus nicht mit anderen zu teilen wird. Die ungenutzten Zimmer sind einfach geschlossen und der ganze Rest des Hauses und Einrichtungen sind Ihnen zu verwenden. Dieses Paket wird ein 325 PS Malibu Turnier Ski-Boot mit einer Illusion bieten X Spur-Brett-Turm und Wedge, Ski / Wakeboard Ausrüstung, Neoprenanzüge, usw. sowie einem hochqualifizierten Boot Fahrer / Trainer mit über 18 Jahren Erfahrung mit Anfänger 2 Jahre arbeiten, erreicht Skifahrer / Wakeboarder und sogar Großeltern. Viel Spaß und bauen Erinnerungen, die Sie nie vergessen werden. Die Preise sind in der Rate Abschnitt weiter unten beschrieben. This wonderfully spacious and luxurious home is a vacationers' dream. Clean and comfortable with every amenity. Hot tub was a welcome addition after a day of skiing. Recommend highly for families or a group of friends. Our hosts were amazing and very welcoming. This massive, luxury cabin made our stay at Ashley Lake an amazing experience. The bedrooms were enormous and every feature was top-notch. It was a beautiful location right on the lake. Only issues we had were the hot tub not working, the internet stopped working and the dock needed some padding for securing the boats. Great place, and I would recommend it to anyone who wants a multi-family experience of a lifetime! 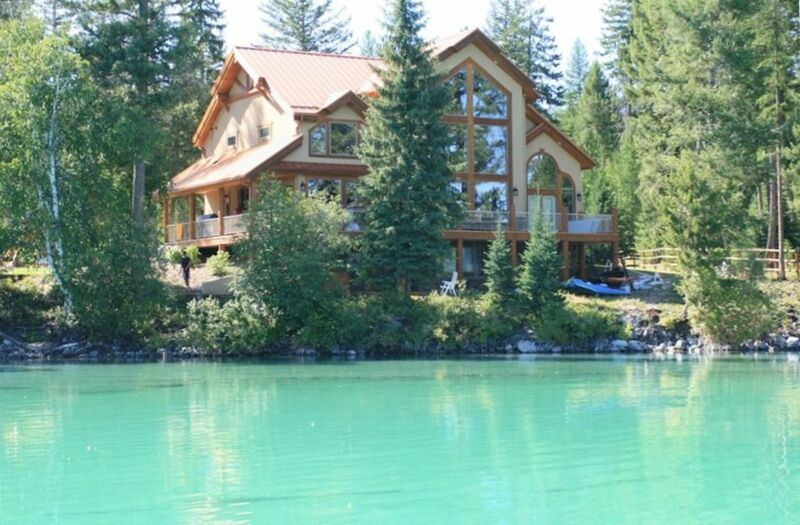 This cabin is AMAZING. The owners are quick and thorough. They answered all of my questions and were easy to get a hold of. They really went above and beyond to accommodate myself and my family. The cabin is in great shape. It's super clean, fresh linens, fully stocked with everything, bathrooms are spotless (a big seller for me!) and the beds are comfortable. This place looks exactly like the pictures. It is gorgeous and the views are breath taking. There is a theater room downstairs, that makes movie nights awesome. As a returning guest I can say the lake is perfect for water sports in the summer and fully stocked with fire wood for campfires in the summer or winter. You will not be disappointed in your stay here! First and foremost I'd like to point out that the the owners of this property are cordial and generous hosts. Our contacts with them were excellent, our questions were answered and they they were "there" to help with any "emergency" inquiries. Everything in the house was made available to us right down to the salt and pepper in the pantry. There were 20 of us in our group including 9 grandkids ranging in age from 11 down to three months. The six bedrooms of the house accommodated our group perfectly. Everything stated in the description of the "cabin." was absolutely accurate. "Cabin", however, is a misnomer of the first magnitude! The home is gorgeous, large and yet was very cozy. The "secret room" kept the grandkids occupied along with the swings, trampoline and other kid friendly toys. The home theater and hot tub did a great job helping our adult children relax. The huge deck offered great views of the lake. The property is quiet and secluded, but is only an hour from the West entrance to Glacier National Park and closer to many other attractions. The owners even put together a list of suggestions as to how to enjoy the area. I speak for our entire family when I say that the experience for all of us was stellar and our week at "Glacier" was made perfect because of the "cabin." All financial transactions were conducted through Pay Pal and our security deposit was back to us within days of us leaving. Everything about the operation of the rental was highly professional. If we ever return to to the area, this home would be our first choice as our base of operation. Many thanks to our friendly and engaging hosts. We are so happy that you had a wonderful stay at the cabin! Thank you for your kind review. We hope you will come again. Warmest regards!! What a wonderful, memorable time our family had at this beautiful mountain retreat on the lake. Five families (16 people) with children 3-19 years of age enjoyed this spacious, well-decorated home. Everything was set up perfectly for big family gatherings; the property and home was immaculate and well maintained.The younger grandkids loved the "magic room" and playground, the older kids played ping pong and relaxed in the hot tub while the adults enjoyed the awesome deck and fantastic view of the lake. The kitchen had everything we needed for any type of cooking, all six bedrooms were spacious and comfortable, the great room with gorgeous fireplace was the favorite place to be at the end of the day. To experience the beauty of Montana with a lakeside view, this is the place to be; we highly recommend it and hope to return again! Kajaks für den frühen Morgen paddeln auf einem See aus Glas. Mountainbiking und Wandern Routen in der bewaldeten Bergplatz nur durch die Hintertür.